Kyshona Armstrong, a music therapist gone rogue, began her career working in mental health hospitals and correctional facilities, writing music with her patients and using music to redirect behaviors and emotions. Kyshona soon found the need to write music independently to help her process her daily experiences with her clients. Audiences will often find a common thread of overcoming, hope, and empowerment in her songwriting and storytelling. 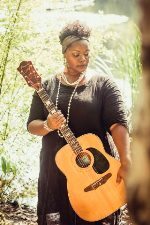 She uses her emotional intelligence to create her unique bluesy and soulful style of music. Her latest album, "The Ride", shows off vocal stylings that are reminiscent of Aretha Franklin, Etta James and Al Green.